The Picture Exchange Communication System (PECS) is an invaluable resource, which can be used with children and young people with Autism Spectrum Conditions and other communication difficulties. PECS does not require complex or expensive materials and can easily be used in school, home or in the community. 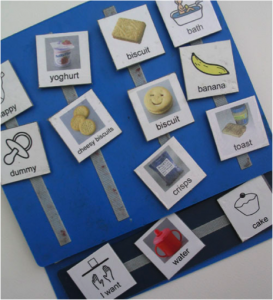 PECS is a type of Augmentative and Alternative Communication that uses visual symbols to teach the learner to communicate with parents, carers, teachers and peers. The aim is to teach intentional, functional communication and to allow users to communicate their wants and needs. The PECS approach occurs in 6 phases. The later stages include using ‘wait’ and ‘no’ with users and teaches attributes and additional vocabulary. The exchange initially involves the user, a communication partner and a physical prompter. The physical prompter is required in the early stages, when teaching the exchange. However, as the user becomes more skilled there only needs to be a communication partner. Who can PECS be used with? PECS can be used with children and adults with a range of Speech, Language and Communication Needs (SLCN). It is frequently used with children and adults with Autism Spectrum Conditions and those who have little or no verbal communication. PECS is a highly structured system and its effectiveness and efficacy is based on consistent use of the system. Almost anyone can implement PECs, however they need to receive PECS training. Professionals, parents, carers, teachers, siblings and peers have all learnt to effectively use PECS and value their role as a Communication Partner. Our therapy team can advise you on how you can implement PECS in your home or setting. At every possible opportunity! PECS becomes the users voice, and they should have access to the system at all times. PECS can be used anywhere; at home, school, and during community activities. PECS books are made portable so that they can be used frequently in a range of settings. Click here for our free PECS symbols that are ready for download. For further information about how to implement PECS, contact our team where one of our therapists will be happy to help.